Reading and share top 4 famous quotes and sayings about Washington Monument by famous authors and people. Browse top 4 famous quotes and sayings about Washington Monument by most favorite authors. 1. 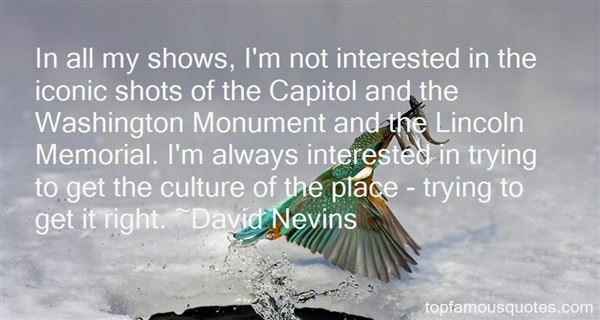 "In all my shows, I'm not interested in the iconic shots of the Capitol and the Washington Monument and the Lincoln Memorial. I'm always interested in trying to get the culture of the place - trying to get it right." 2. "Honorius Hatchard had been old Miss Hatchard's great-uncle; though she would undoubtedly have reversed the phrase, and put forward, as her only claim to distinction, the fact that she was his great-niece. For Honorius Hatchard, in the early years of the nineteenth century, had enjoyed a modest celebrity. As the marble tablet in the interior of the library informed its infrequent visitors, he had possessed marked literary gifts, written a series of papers called "The Recluse of Eagle Range," enjoyed the acquaintance of Washington Irving and Fitz-Greene Halleck, and been cut off in his flower by a fever contracted in Italy. Such had been the sole link between North Dormer and literature, a link piously commemorated by the erection of the monument where Charity Royall, every Tuesday and Thursday afternoon, sat at her desk under a freckled steel engraving of the deceased author, and wondered if he felt any deader in his grave than she did in his library." 3. 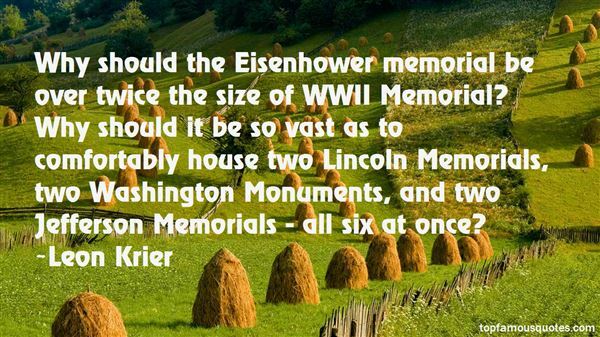 "Why should the Eisenhower memorial be over twice the size of WWII Memorial? Why should it be so vast as to comfortably house two Lincoln Memorials, two Washington Monuments, and two Jefferson Memorials - all six at once?" 4. "A legacy that powerful does not disappear. Next to the Egyptians, the Greeks and Romans were babies. Our modern nations like Great Britain and America? 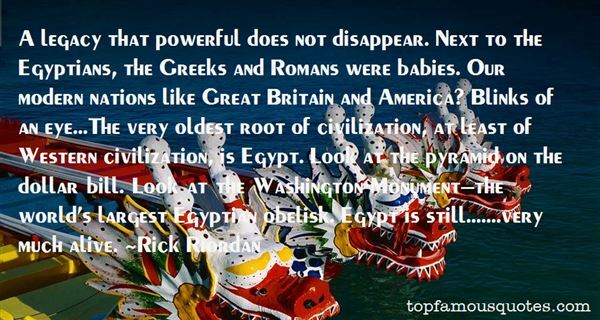 Blinks of an eye...The very oldest root of civilization, at least of Western civilization, is Egypt. Look at the pyramid on the dollar bill. Look at the Washington Monument—the world's largest Egyptian obelisk. Egypt is still.......very much alive." Why were we so far apart, even when we were together? It was a nice loneliness, like the sensation of washing your face in cold water."